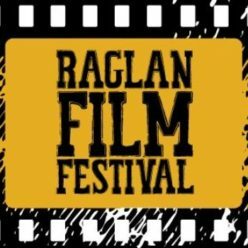 The Raglan Film Festival opened on Thursday night to a great start with a full house for the world premiere screening of Te Kumara. 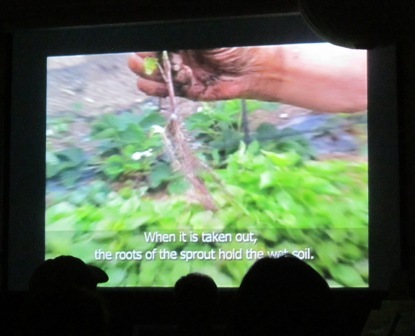 This beautifully crafted documentary about the traditional ways of growing and storing kumara was enthusiastically received by the audience. Produced by Whaingaroa’s own Te Mauri Tau it covers the path of the kumara from the seed bed to the storage pit. After Arts Council Chairperson Rodger Gallagher welcomed the audience to the 3rd Raglan Film Festival, kaumatua Sean Ellison blessed the Film Festival and the screening. Ruth Port then introduced Tuihana Bosch who explained the making of the film and its purpose. Many people stayed on after the screening for a discussion. Te Kumara is produced in te reo Maori with English subtitles. 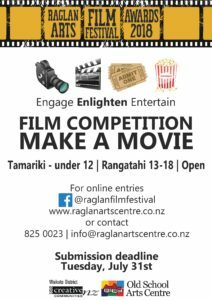 It is a nominee in this year’s Raglan Arts Film Festival Awards (RAFFA). A longer version entirely in Te Reo has also been produced. The documentary will be used as part of the Enviroschools programme through New Zealand. 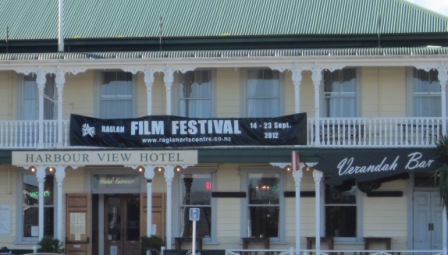 With just over 24 hours till the start of the 2012 Raglan Film Festival the countdown has begun. And the addition of the world premiere of Te Kumara, the Festival is starting one day early at 8pm on Thursday 13th September. The Raglan Film Festival is starting one day early on the 13th September with an 8.00pm screening of Te Kumara. This inspiring local documentary features kuia and kaumatua telling the story of the kumara from the seed bed to the storage pit. This is a beautifully crafted documentary about the history and story of of the kumara by Whaingaroa’s own Te Mauri Tau. there will be an introduction by Tuihana Bosch and Q&A afterwards. Reservations are already high, so it is advisable to book if you wish to attend. Produced in te reo Maori with English subtitles. 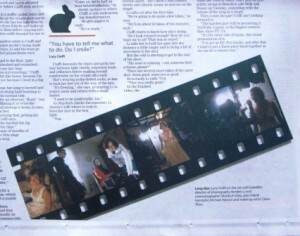 A full page article in the Saturday August 18th issue of the Waikato Times covers the making of a music video by Raglan’s Lucy Cioffi, otherwise known as Little Lapin, that is an entry in the Raglan Arts Film Festival Awards. Made by Hamiltion’s Indiefilm company, the video of Lucy’s song, Silent Tears was shot at the Woodlands heritage homestead at Gordonton. The video was filmed under the watchful eye of Times reporter Tracey Cooper who spent hours on the set while the video was filmed in a Victorian style by Director Borden Li, cinematograher Murdoch Daly, hairstylist Michael Herwin and make-up artist Claie Zhao.